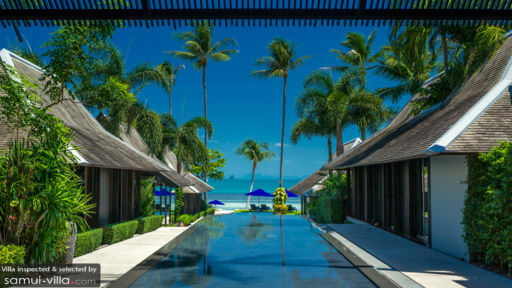 Located on the West Coast of the island of Koh Samui, Villa Akatsuki is a luxury holiday villa ideal for a tropical getaway in the heart of Thailand. Offering its guests panoramic views of the Five Islands of Thailand, and access to the beach right from the villa, Villa Akatsuki is a beautiful and sprawling holiday retreat. 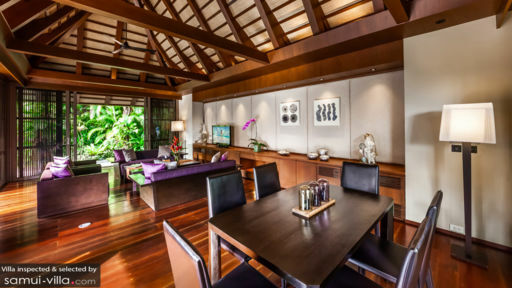 The villa has been designed keeping in mind the Japanese minimalistic style infused with Thai hospitality, a perfect blend of luxury and comfort! There are 5 spacious and beautifully laid-out bedroom suites in Villa Akatsuki, each named meticulously after the sky, ocean, water, joy, and heart. Four of the rooms are furnished with plush king-sized beds, one with additional space for futons. The last room is furnished with two single beds fit for children. Most of the rooms have access to a private balcony and glorious view of the beaches. Each of the rooms has an equally opulent en-suite bathroom which comes with a Japanese-style Yukata, for a more authentic experience. Other amenities include flat-screen TV, internet, and surround-sound system. Stretching afar, the views from Villa Akatsuki are unbeatable with the unobstructed scenic beauty of the blue clear waters of Thailand. The villa harbours a three-tier pool that cascades onto another like waterfall. On one end is the infinity-edge pool looking out towards the beach, and another is the shallower end fit for children. Besides the pool is a sheltered Sala to keep you from the sun after a dip in the pool. Bordering the villa are an array of tropical plants and trees, making for an exotic holiday experience amidst blue waters, clear skies, and natural vegetation. You can breathe in a lungful of fresh, refreshing air or bask in the sun and work on your tan. There are landscaped terraces outside which contribute to the luxurious and immaculate appearance of Villa Akatsuki. As you enter the villa, you will be greeted by the expansive and opulent atrium, which holds the reception area and a sitting area. The space is tastefully decorated keeping in mind Japanese style of living and instantly transports you to another world. A separate living pavilion has been designed with the utmost comfort in mind. It is furnished with comfy cushioned cabanas and sofas. The dining pavilion overlooks the pool, beach, and garden terraces and is a calming spot you can enjoy your breakfast, lunch and dinner in. The kitchen has been carefully designed with all the necessary appliances and much more. There is a coffee machine, a hand-selected collection of Japanese tea and a Japanese shaved ice-maker for the kids. A theatre pavilion is also available in case you need to indulge in luxurious experience of watching a film home-theatre style. With comfortable seating fit for even business meetings, etc. this room is ideal for a private movie screening and the likes. The generous and gracious staff at Villa Akatsuki are praised for their accommodating nature and their readiness to serve. They will cater to all your needs at the drop of a hat without your having to ask for it. The personal chef will willingly construct scrumptious delights for you, as per your preference of the day, with local fresh produce. There are several other activities you can do at Villa Akatsuki such as getting a Thai massage at A-Spa, or learning new skills by opting for Thai cooking classes or Muay Thai. 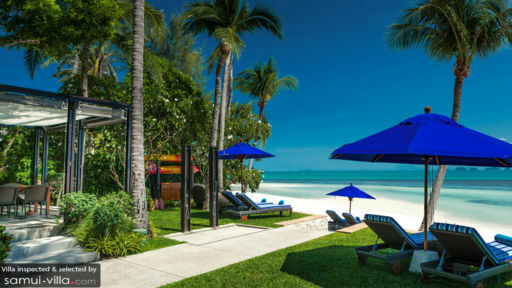 On the Lipa Noi beach, Villa Akatsuki is in a quieter, exclusive spot on the beach away from the holiday crowd. The villa organises a local Food Market Tour for its guests, where you get to taste the local delights of Koh Samui along with fellow travellers.